Whew, that title is a mouthful! Years ago–more years than I care to count–I had my gallbladder removed. I had gotten gallstones as a side-effect of birth control pills. I had no idea why every month I would get an attack of crippling, writhe-in-agony pain, until it finally landed me in the emergency room. The ER doc was a woman, and I suspect I was fortunate in that regard because I rather doubt a male doctor would have made the connection between The Pill and The Pain, gallstones being one of the rarer side effects. Anyway, I was told my gallbladder would have to come out, and I obediently went along with the plan. Having my gallbladder removed (the surgery is called a cholecystectomy) was probably a huge mistake (taking The Pill definitely was) and has almost certainly led to numerous digestive and abdominal complications for me. Collectively, these are known as Post-Cholecystectomy Syndrome (PCS). Sometimes PCS is caused by stones in the bile duct of the liver, or by scar tissue from the surgery, or by the constant drip-drip-drip (and occasional gush) of bile into the small intestine, but it all boils down to problems resulting from there not being a gallbladder to store, concentrate, and control the release of bile. Most of the symptoms of gallstones (the most common reason for a cholecystectomy) are also symptoms of PCS. And we know that PCS is caused by not having a gallbladder. That means you can have the same symptoms with or without a gallbladder. Another way of looking at this is to say that, 5%-40% of the time, removal of the gallbladder doesn’t cure whatever was wrong in the abdomen, or at least not all of it, so the problems continue even after it’s gone. “Cutting out a body part is treating the symptom, not the cause,” writes Mary Ackerley, MD, MDH, ABIHM in this article. Maybe my gallbladder would have had to come out anyway; I’ll never know. At any rate, it’s gone now and there’s no use crying over its tiny little green body (yep, gallbladders are green). Let us instead turn to treatments for PCS. Bear in mind that this is a work in progress–a topic I am still researching. But here is what I have learned so far. 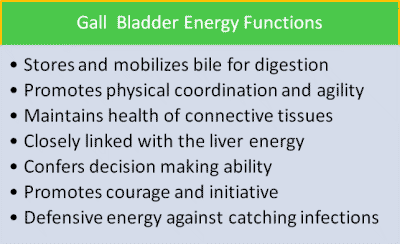 The gallbladder is responsible for the dispersal of yang qi throughout the body. 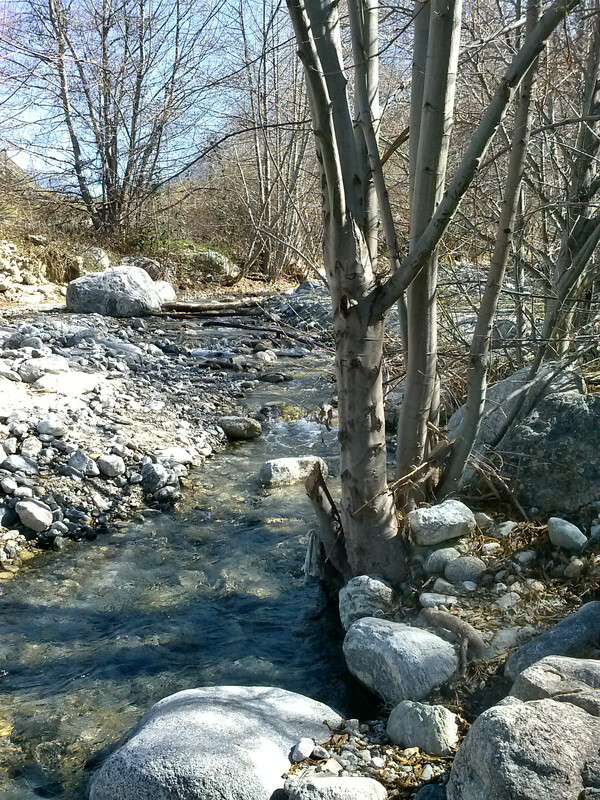 The yang qi warms the body and prevents the accumulation of excessive dampness and cold. Without the gallbladder, qi can not be distributed normally and it “stagnates” in the abdomen, affecting in particular the liver, stomach, and spleen. Moreover, it cannot combat dampness, which then accumulates in the body. The combined effect of heat and dampness in the upper abdomen results in the symptoms of PCS. Furthermore, when the bile doesn’t flow normally from the liver, “liver qi stagnation” can develop, and this is the root of many ills. Obstructions caused by adhesions and scar tissue resulting from surgery can also disrupt blood flow and result in “blood deficiency.” When the liver qi isn’t flowing through the body as it should, it can flow across to the stomach, kidneys, and/or spleen, interfering with their normal processes. In a nutshell, not only does this contribute to the symptoms of PCS, but to all sorts of other problems as well, including irritability, moodiness, stress, and depression. This actually fits pretty well with a traditional Western explanation for PCS. In the Western tradition, there is no concept of qi, but there are the temperature and moisture axes (hot to cold, dry to damp), as well as concepts of energetic excess and deficiency, and of movement, torpor, and stagnation. So the description of heat and dampness in the liver system overflowing into the stomach, kidneys, spleen, and intestines makes perfect sense and fits with the observed symptoms. Viewed from this perspective, we can see that dampness and heat is a cause of the symptoms cholecystectomy is supposed to cure, and removal of the gallbladder actually worsens the dampness and heat and causes it to spread. Even if your gallbladder really did need to come out (e.g., if it ruptured), you are likely to still have dampness and heat affecting multiple organ systems. …both of which cause diarrhea. Also, if you’re not digesting fat properly, then it’s not fully available for your body to use as nutrition. One of the ways in which the liver disposes of excess fats/cholesterol is by binding them up with bile salts and sending them on down the intestines to be excreted. But bile salts themselves are derivatives of cholesterol! This means that you need some cholesterol to make bile salts to get rid of excess cholesterol. I’ll be coming back to this point in a bit. It seems to me the first order of business is to support the liver. There are many herbs that can do that, but my go-to herbs here would be dandelion and milk thistle (which I discussed in my previous post). Mountain Rose Herbs makes a “Liver Care” extract consisting of dandelion, milk thistle, yellow dock, schisandra, and Oregon grape root, which sounds like an excellent blend, though I would use bayberry rather than Oregon grape. One day soon I hope to come up with a PCS-specific blend myself. Anise and fennel are helpful with gas and bloating, but both have a liquorice flavor I’m not terribly fond of. Still, their benefits are such that I can put up with it. TCM also recommends bupleurum, rose (specifically Rosa rugosa), dried ginger, eupatorium (boneset), skullcap, pulsatilla, fennel, cumin, garlic chives, and liquorice. (Note that dried ginger is very heating.) I would consult with a TCM practitioner since they use very complicated blends of herbs, as well as herbs which are not part of the Western materia medica and I think they will make custom blends. Alternatively, you may find that you suffer more from irritation in the upper GI tract, and mucilaginous herbs such as marshmallow and liquorice may be of assistance there (though they will increase moisture). In general, you will want to avoid warming, moistening herbs, because there is already excess damp and heat. Go for cooling, drying herbs and astringents. Next you are probably going to have to supplement with bile salts. When bile salts are deficient you end up with an overload of fats that cannot be properly digested or stored. Some of it is going to get stuck in the liver. Excess fat in the liver results in insulin insensitivity, which in turn results in insufficient bile secretion. So there is a nasty downward spiral here. Supplemental bile salts help to compensate for the lack of concentrated bile, and in turn helps you digest the fats you eat. “When we eat fats composed of LCTs [long-chain triglycerides] they travel through the stomach and into the intestinal tract. It is in the intestines where the vast majority of fat digestion occurs. Pancreatic enzymes and bile are necessary for digestion. LCTs are reduced into individual long-chain fatty acids. These fatty acids are absorbed into the intestinal wall. Inside the intestinal wall they are repackaged into bundles of fat and protein called lipoproteins. These lipoproteins are then sent into the bloodstream. As they circulate in the bloodstream they release particles of fat. This is the source of the fat that collects in our fat cells and the fat that collects in and clogs up artery walls. As the lipoproteins get smaller they eventually go to the liver. In the liver they are dismantled and used for energy or repackaged into new lipoproteins and again sent back into the bloodstream to disperse fat throughout the body. “MCTs [medium-chain triglycerides] are processed differently. When we eat a fat containing MCTs, such as coconut oil, it travels through the stomach and into the small intestine. But since MCTs digest quickly, by the time they leave the stomach and enter the intestinal tract they are already broken down into individual fatty acids (MCFAs [medium-chain fatty acids]). Therefore, they do not need pancreatic enzymes or bile for digestion. Since they are already reduced to fatty acids as they enter the small intestine, they are immediately absorbed into the portal vein and sent straight to the liver. In the liver they are preferentially used as a source of fuel to produce energy. MCFAs bypass the lipoprotein stage in the intestinal wall and in the liver. They do not circulate in the bloodstream to the degree that other fats do. Therefore, they do not supply the fat that collects in fat cells nor do they supply the fat that collects in artery walls. MCFAs are used to produce energy, not body fat and not arterial plaque” (emphasis mine; source is here). So medium-chain triglycerides should be more easily-digestible for people who don’t have sufficiently strong bile, and they are less likely to contribute to the fatty liver-insulin insensitivity-even less bile spiral. MCT fats are the exception to the rule that you should strictly avoid saturated fats. Foods with medium-chain triglycerides include coconut oil, butter, whole milk, and palm kernel oil. For healthy fat metabolism sans gallbladder, you need (a) sufficient bile salts to bind up the fats/cholesterol, (b) something to soothe and protect the intestinal lining irritated by constant exposure to weak bile, and/or to bind up that bile, and (c) something to break up undigested fats in the intestines in lieu of strong bile. In addition to bile salts, choline can help with fat digestion and reduce gas and bloating. Meanwhile, leafy greens such as kale, collards, mustard greens, chard, nettles, and dandelion are really good for the liver so try to work more of those in. These help cleanse, help the liver produce and secrete bile, and are full of vitamins and minerals. Based on my experience I suspect that dairy is generally not a friend to the PCS sufferer, since even when non-fat it still contributes to mucus production (dampness); however, I do make sure to eat small amounts of whole-fat milk, butter, and yogurt from pastured cattle. When I can afford it (it costs an arm and a leg here) I get raw milk. These taste sooooo much better than the typical grocery store varieties and are more nutritious. Refined sugar is also probably best avoided because in excess the liver will turn it into fat (not the good kind), and without a gallbladder, whatever fat the liver sends to be excreted through the digestive system is going to cause pain, gas, bloating, gurgles, and diarrhea. Eating frequent small meals means there will always be something in the intestines to absorb excess bile, but by itself this won’t be sufficient because without a gallbladder, it’s difficult to digest these things correctly to begin with. Eating high fiber foods such as oats, nuts, and legumes (especially peanuts) can help to sequester excess bile. All I’m going to say about exercise is that TCM says exercise gets stagnant qi moving, and we all know movement is good for us. It can be gentle and still be effective. According to TCM, liver qi stagnation often results from emotional conditions, such as chronic anger and anxiety. However, the removal of the gallbladder also contributes to emotional states, including anger and depression. Therefore, it’s important to care for yourself psychologically and emotionally. I personally strongly recommend meditation for stress reduction, though I understand it’s not to everyone’s taste. Listening to binaural beats or isochronic tones (I like the ones by FingerprintDiva on YouTube) can get your brain into a brainwave state which is very helpful for promoting good sleep and relaxation–look for alpha waves specifically. I personally do not endorse fasting “liver cleanses” with olive oil and lemon juice or epsom salts. If you have PCS, your liver is already under a lot of stress. 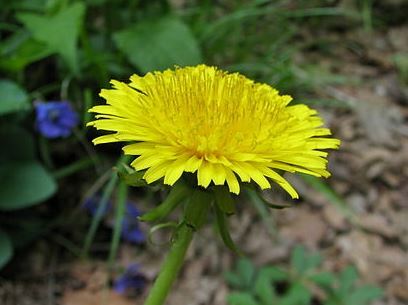 A course of dandelion alone is a safe, gentle detoxifier. Besides, your problem here isn’t a buildup of toxins per se. If you feel the need to detox I would recommend just doing a short fast, supported by herbs, as opposed to fasting + giving yourself a massive case of the trots for no reason. I’m not a doctor or expert in physiology; what you read here is the best information I’ve been able to compile over the last couple of years. So far as I know, there is no other place on the web that puts all this info together for the PCS sufferer (although the internet is vast and I could be wrong). I hope the info will be useful, but as with anything your mileage may vary. Finally, everything I have suggested here as a remedy should also benefit those who still have gallbladders that are giving them trouble. I received a great comment on my previous post about PCS (the suite of annoying symptoms that can result from not havaing a gallbladder) and decided that a follow-up was in order. I also wanted to include some more personal details (hopefully not TMI) to put the information in context. I continue to struggle with PCS everyday, and the reason I wanted to revisit the topic is that I am my main test subject when it comes to trying out potential remedies (cue mad scientist laugh). I thought it might be useful to others if I actually reported on my findings, such as they are. First of all I want to say that I fit the classic symptom profile from Traditional Chinese Medicine (TCM) really well. I can’t say for certain whether all these symptoms come from having no gallbladder, but they do post-date that time. For reference, I was 20 when I had it removed. Obviously I have aged since then, and I can’t be sure to what extent age and abuse through suboptimal diet may be influencing my symptoms. But they do correspond to exactly what you would predict for PCS. Also, I should point out that these symptoms did not appear immediately after I had my gallbladder removed–they have developed gradually over the years. Before having my gallbladder out, I tended to feel colder than other people. I did radiate heat–when riding in a car the window by my head would always get steamed up when nobody else’s was and people commented that I felt warm–but internally, I was usually cold. And I couldn’t stand any external cold at all. Since the gallbladder removal (I’m going to call it GBR to save my lazy fingers effort), I have excess heat (and dampness–I’ll get to that in a minute). I get heat stroke really easily and also the symptoms of what Chinese medicine calls “summer sickness”–dizziness, nausea, fatigue, loss of appetite, and diarrhea whenever it’s hot. Most days I have a feeling like there is a smoldering fire in my chest and solar plexus region that cannot be cooled. It’s not heartburn–it doesn’t have that acid burning feeling, just a sense of uncomfortable heat, as if I have been lying out in the sun on a hot day for a few hours. Inflammation is supposed to be a sign of dampness, but I don’t happen to have that (at least not externally visible). I have, however, started to accumulate phlegm much more than ever before and I also have more skin tags. Not a huge amount, but I never used to have any. In TCM they are considered the result of heat coming from the liver and trying to emerge from the skin. I don’t have acne, but occasionally get small pimples in the liver zone (creases on either side of the nose). This is the only place I ever get zits. Finally I have dull pain in the upper right quadrant of my abdomen, especially when I sit on airplanes. Something about that particular airplane posture and the immobility, I guess. I have a plethora of different nutritional supplements and herbs–none has been a magic bullet, though most help a bit; but it can take time to find the right herbs and dosages. And sometimes it’s harder to get the mix right for yourself than for another person, for some reason. I take the following Standard Process supplements: Cholacol (bile salts), Drenamin (adrenal fatigue), and Livaplex (supports liver function). I also take the following herbs: dandelion and milk thistle (liver support) and bupleurum (liver and adrenal support) tinctures regularly, though I need to up my dosage, and agrimony. I also take melissa (lemon balm) and St. John’s Wort on an as-needed basis but need to make my melissa consumption more regular. I want to add rose to this list because my body seems to really like it and for its cooling effects. The results are that my energy levels are up a bit. I’m no ball of fire but at least I don’t have to take a nap after washing the dishes. My mood is much more stable with less depression and anger. My immune system seems to function pretty well–I get few colds and flus, maybe 1 per year, although the flu is more severe when I do get it than it used to be. There is still room for improvement here. My digestion is still suboptimal but I also need to work on that more, especially in terms of dietary change–on which more below. 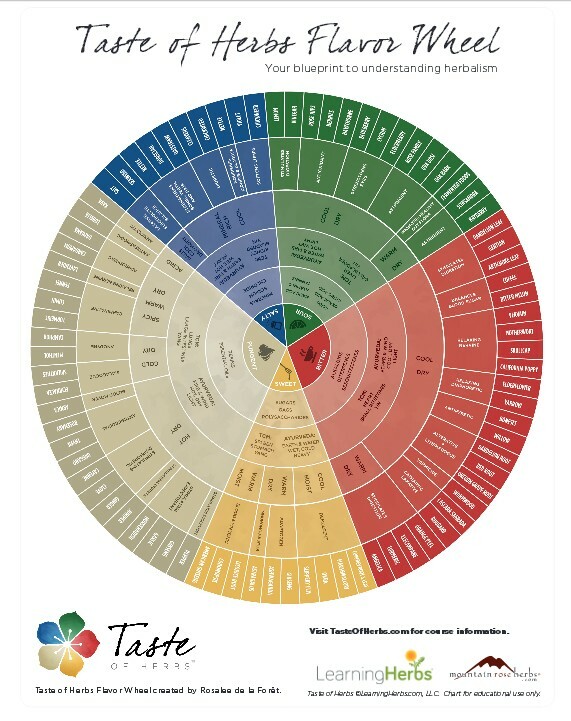 This chart groups herbs by flavor, tells you their energetics, and correlates them with TCM and Ayurveda. All three systems are agreed that you want to seek out herbs in the red section. Astringents (the green section) can also help by toning weakened tissues. Because of the interconnectedness of the digestive system with every other system in the body, one seldom has only one issue going on. But the great thing about this chart is that you can classify foods and herbs that aren’t listed, simply by tasting them. By the way, if you’re wondering why I mention TCM so much it’s because it is so hard to find anything in the Western herbal literature specifically devoted to PCS/gallbladder problems. 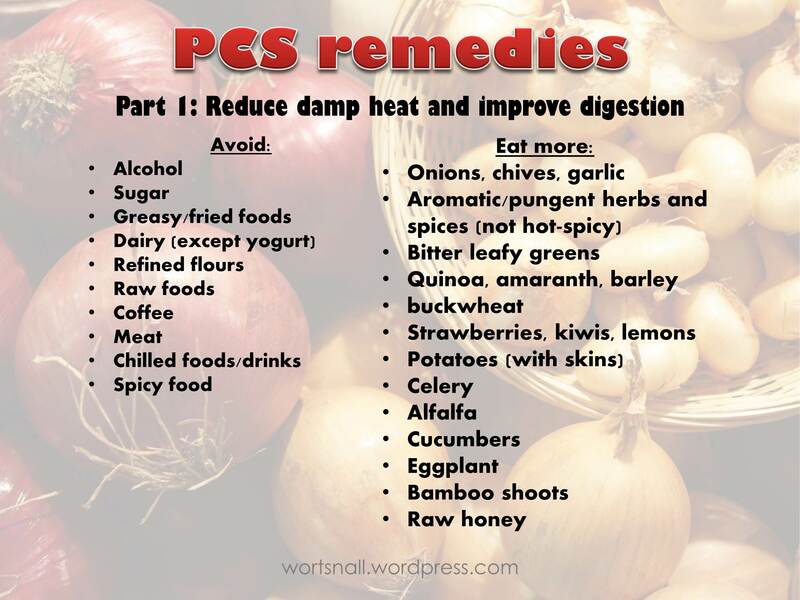 Chinese medicine views the development of gallbladder symptoms and PCS as both being due to excess damp heat. The dietary guidelines for reducing dampness and heat recommend avoiding alcohol, sugar, greasy/fried foods, and dairy (except yogurt), refined flours, raw foods, chilled foods/drinks, coffee, meat, and spicy foods. I have not been doing so well with this, even though I know better. The hardest part, especially in summer, is avoiding the cold food and drinks. They do give a brief cooling feeling, and I’ve always preferred cold drinks even back when I felt cold all the time. That’s why I mostly take my herbs as tinctures instead of teas, because I just really don’t like hot drinks. But I should be taking things room temperature to warm. Foods that are said to relieve heat and dampness include: onions and their relatives (garlic, chives, scallions, leeks), cinnamon, aromatic herbs (parsley, basil, dill, rosemary, oregano, etc. ), raw honey (like I need an excuse! ), alfalfa, celery, lettuce, spinach, bamboo shoots, eggplant, potatoes (with skins), Chinese cabbage, dandelion greens, mustard greens, barley, buckwheat, strawberries, lemon, kiwi, hawthorn berry, fennel, mustard seed, ginger, turmeric, saffron, radish, asparagus, broccoli, turnip, radish, quinoa, amaranth, adzuki beans, and cucumber. This ain’t no paleo diet. You’ll notice there are items here that fit in the pungent (grey) and sour (green) categories on the flavor wheel, as well as bitters. Recommended herbs for tissue relaxation are all astringents and include blackberry (excellent for diarrhea, especially where the mucosal lining of the bowels is impaired, as is often the case due to weak bile dripping directly into the intestine from the liver–the fruit, leaf, and root may all be used; you can substitute raspberry leaf), sumac (not the poison kind–sumac is commonly available as a condiment in Middle Eastern groceries), black walnut (leaf, bark, black hulls; also helps with hypothyroidism but the hulls can be laxative so use these with caution), white oak bark (small doses of tincture), and sage. The traditional recommendations for torpor are alteratives (“blood purifiers”) and laxatives. If you don’t have a gallbladder, there is a good chance you do NOT need laxatives. Recommended herbs for torpor include dandelion, burdock, and Oregon grape root. Sage and burdock particularly seem to help with digestion and metabolization of fats. I also just came across this wonderful piece on Cauldrons & Crockpots about ocotillo and how it helps move stagnant fluids in the body. For cooling, Western herbalism recognizes that heat can be a secondary effect due to “sepsis and deterioration,” as Wood puts it, or primary, due to irritation and excitation, which is essentially acceleration of cellular function. With PCS there may be both types but I think the secondary heat arising from an under-performing gut and liver is the main issue. Recommended herbs include rose (all parts; cooling, astringent, and drying), yellow dock root (cooling, bitter, alterative), and yarrow (cooling and stimulating). And of course, exercise. We’re not talking here about weight loss or get-fit exercise, we’re just talking about moving the qi and fluids around. I am a big fan of the website Katy Says which is all about the importance of proper body alignment. Working out, running, cycling, dance–all are fine but do not replace time spent simply sitting, walking, and carrying things in correct alignment. If you’ve been out of alignment, as most of us in the modern world are, at the beginning just standing in proper alignment will be a workout for the back of your legs, pelvic floor, and shoulders. Anyway, I hope this helps somebody. As I said previously, I’m not a doctor, but this is the best information I’ve been able to glean on the subject. I have not found a lot of useful information, and much of what I have found doesn’t have any contextual information. I gave you all far more detail about my health than probably any of us are comfortable with, but I am hoping I have given you a clearer picture of how it all fits together to affect not only your body, but your mind and emotions too. 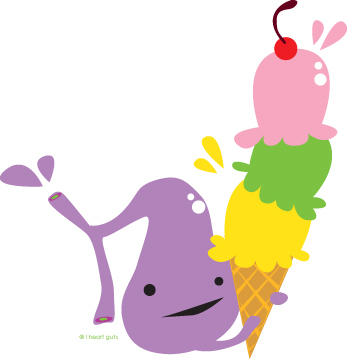 My thoughts on dealing with Post-Cholecystectomy Syndrome (PCS)–pain and digestive problems after having your gallbladder removed–have evolved somewhat, so I felt I had to write an update. Several people have commented on the previous posts thanking me for addressing it, which (1) is very flattering–thank you for reading!–and (2) makes me feel the weight of responsibility to not convey wrong information. I promise to share only the best information I can find, but there isn’t a lot of information available, so my understanding of the topic is bound to change somewhat as I learn more. To recap, in my first post I discussed the symptoms of PCS and what (little) I know about fat metabolism, since that is where the now-absent gallbladder comes into play in digestion. I briefly went over the role of the gallbladder in Traditional Chinese Medicine and herbs they use for gallbladder problems. This is because I’ve never seen it addressed from a Western herbal perspective. Based on that, I made some suggestions for herbal and nutritional support for the upper GI tract and liver. In my second post on the topic, I opened up a bit about my own experiences with PCS and attempts to remedy it. In particular I suggested that since gallbladder inflammation, gallstones, and the symptoms of PCS seem to correlate with heat and dampness in the upper digestive tract/liver, one might treat them using astringent and bitter herbs–that is, herbs with cooling energetics. 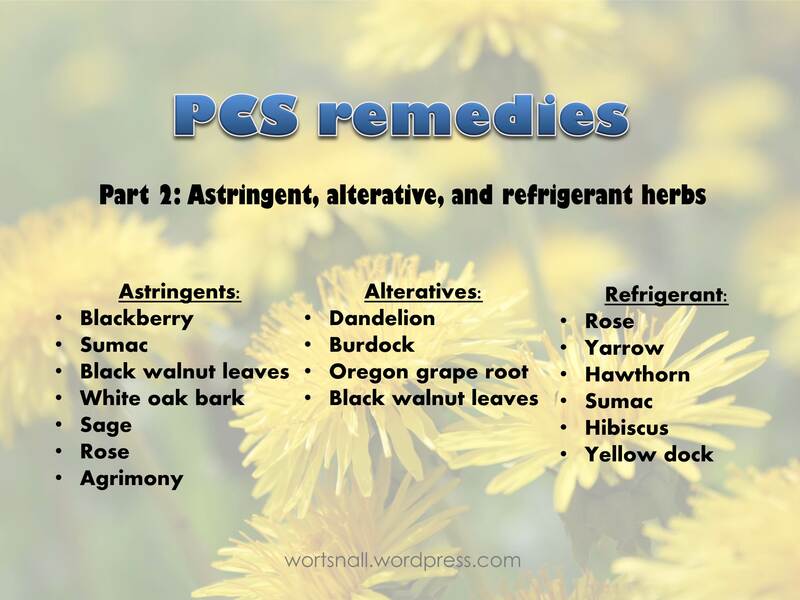 But today I realized that while it might make sense to treat excess heat and damp with herbs that cool and dry, this is not the best long term solution for PCS or gallbladder problems. I do believe they could give short-term relief, and they might be warranted anyway for related conditions (for example if you also have a leaky gut, astringents would be helpful). So that was in the back of my mind. Then today I was experimenting with an Echinacea tincture I just made, taking note of where I felt it working its magic. Echinacea is a diffusive lymphatic or lymphagogue, which is a fancy way of saying it moves your lymph around. And all of a sudden the pieces came together: stuck fluids need movement. And heat needs not cooling so much as release–a path through which it can escape your body. From the Traditional Chinese Medicine point of view (and I have to reiterate I am not a practitioner of TCM let alone an expert, but what I relate here is based on my research) gallbladder/digestion/upper GI issues are not just a matter of stuck fluid but of stuck qi (“liver qi stagnation”) and stuck emotions. Both Western and Eastern herbalism are agreed that stagnation is involved and that its proper medicine is movement. It just took me a while to fully absorb the lesson. It’s fitting that it was a lymphatic–Echinacea–that helped me make the connection, because as it turns out, the lymphatic system plays a role in fat metabolism, as does the gallbladder (or lack thereof). I didn’t know about this aspect of the lymphatic system when I wrote about fat digestion previously. While most of the nutrients from your food are transported through the lining of the GI tract to your blood system, there to be circulated around and the wastes processed in the liver, fats are different. Short-chain fatty acids can be directly absorbed into the blood (and then filtered through the liver), but most of the fats we eat are medium- and long-chain fatty acids. These are transported as chyle–“a milky bodily fluid consisting of lymph and emulsified fats” (per Wikipedia)–via lymph vessels from the small intestine to where they need to go for immediate use or storage, and only then enter the bloodstream. The long fatty acid chains are too big to pass directly from the intestine into the veins. By circulating through the lymphatic system, the fat molecules bypass the liver until they have had a chance to be used. The gallbladder’s role is to help digest fats before they get to those lymph vessels, so you can imagine how, if there is no gallbladder or it’s not functioning optimally, the problems will be passed to the next step down the line–the lymphatic system. Improve nutrition by eating lots of vegetables, as we know we should, and by supporting the digestion with carminative herbs and bitters. I cannot recommend bitters highly enough. (I have replaced the bile salts I used to take with bitters and the bitters are more effective. Also, I have come to actually crave that bitter flavor, so don’t let that deter you. Very quickly your body will start loving bitter.) Think ginger, turmeric, black pepper (makes nutrients more bio-available), fennel, cloves, dandelion, burdock, leafy greens (the more bitter the better). You may also need astringents (e.g., rose, agrimony) if you are prone to diarrhea. Move around as much as you can. The lymphatic system doesn’t have its own pump but depends on muscular contractions to move the fluid around. Walk, jump up and down, hang from things, climb trees, get massages, do dry-brushing–you get the idea. But also, relax as much as you can. Tightness impedes the free flow of liquids. I now think that it’s likely PCS sufferers may also need some kind of lymphatic support, and possibly also alteratives. There are many lymphatic movers and each works slightly differently. Echinacea, calendula, alder, ocotillo, red root, chilopsis, cleavers (bonus: cleavers are delicious! ), burdock again. Remember that as the lymph gets moving, two things are likely to happen: (1) any toxins in the lymph are going to get carried to the liver for filtering and removal, so if your liver is seriously compromised (e.g., jaundice) please be very, very gentle and take it slow. See a clinical herbalist, in fact. And (2) any excess internal heat is going to find a way out, so you may see skin eruptions in the form of acne, rashes, or excema. In this case, these are a good sign. Let the heat go. Be aware that signs of stuck fluid may not be nearly as extreme as edema, even though that is the most commonly referenced example. Puffiness around the eyes, a feeling of sluggishness that gets better with exercise, sore glands, a wan, tired, or blah-looking expression, a little excess phlegm or sinus congestion–all these are signs of stagnation. And as usual I want to emphasize that this is not a matter of “detoxification,” but of nourishment and movement. Most of the detox routines out there are at best pointless and at worst dangerous. In some ways what I have suggested here boils down to common-sense “eat right and get plenty of exercise,” but with a few more sparkles. *I don’t know of any research on PCS and the lymphatic system. But according to this article, inflammatory bowel disease (IBD)–which is one kind of poor digestion, caused by the immune system attacking the intestine–leads to compromised lymph drainage and in turn edema, lymph leakage, excess fat deposition, an impaired immune system, and chronic inflammation. Any effects resulting from PCS would presumably be much less severe–but that doesn’t mean there aren’t any.